These days, we are inundated with warped images of how weight loss affects our health. Television shows like "The Biggest Loser" and "Extreme Weight Loss," which tout participants who manage to shed hundreds of pounds in the timeframe of a mere season or episode, can make it seem like weight loss is an all or nothing type of game. While they're definitely entertaining, these shows can give viewers the impression that if they're not dropping immense amounts of weight and seeing immediate results, then their personal fitness is no longer a task worth pursuing. 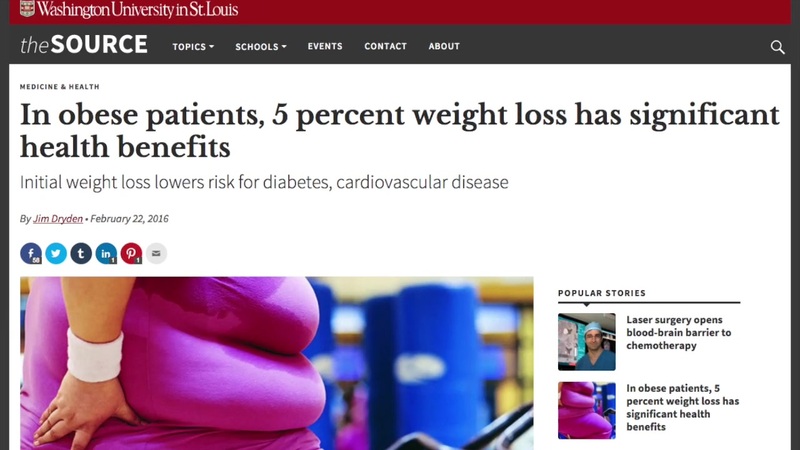 But the latest research from the Washington University School of Medicine in St. Louis suggests the exact opposite: People suffering from obesity who are trying to slim down may see substantial health benefits after losing just five percent of their body weight. Published in the online journal "Cell Metabolism," the study determined that such a relatively modest reduction in body weight can lower the risk an obese person faces of developing diabetes and cardiovascular disease, as well as increase metabolic function in fat, liver and muscle tissue. For the study, 40 obese individuals were instructed to either maintain their present body weight or lose 5, 10 or 15 percent of it by going on a diet. Multiple body responses were measured over the course of the study. Samuel Klein, the study's principal investigator, noted that the study's findings 'demonstrate that you get the biggest bang for your buck with five percent weight loss. The current guidelines for treating obesity recommend a five to ten percent weight loss, but losing five percent of your body weight is much easier than losing ten percent. So it may make sense for patients to aim at the easier target."